The holiday season is just around the corner. So it’s time to get your seasonal email marketing campaigns all wrapped up. Why? Just take a look at this figure: in the US alone, desktop retail ecommerce spending during the 2016 holiday season was a staggering $63.1 billion. We’re not talking pocket money here! So we’ve whipped up this guide to help you get a piece of the pie with email marketing. 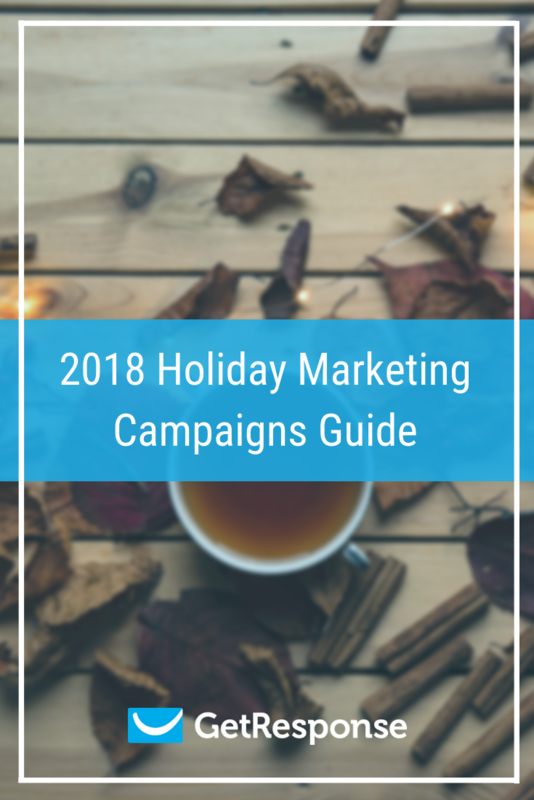 From list building tactics to designing holiday email campaigns – it’s all here. Read on, or use the links below to jump to insights and inspiring examples for your favorite holiday. Running a successful holiday marketing campaign is a little like hosting family dinner. Getting ready before everyone arrives (or lands on your site) means you can enjoy the day (your campaign) without a hitch. A checklist can help. So you stay on track and remember what needs to be done. 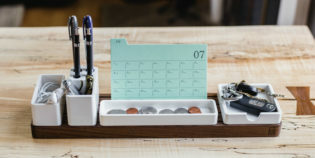 The four steps below will help you plan your campaigns better – and get ready for the rush. First, take a look at all the tactics and channels you used before. What worked well? What could you do differently – or repurpose? Asking these questions can help you make better business decisions, and allocate resources the right way. Here’s an example: A few years ago, everyone was talking about Snapchat as a top tool to reach your audience. But users have since abandoned the platform, and turned to other tactics like Instagram Stories. So if you don’t reflect on your past efforts, you might end up investing in a tactic or channel that simply doesn’t do the job – or underinvesting in a tool that could get you the best results. Next up, look at your customer segments. Who do you attract? Who often buys from you – and who spends the most? Who sticks around – and who leaves? When you dig deep, you might spot potential segments – or learn more about the people you already serve. A popular way to do this is with an RFM (Recency, Frequency, and Monetary Value) analysis, to focus on your most lucrative buyers. Facebook Audience Insights is another great tool you could pair with RFM. Simply import your email database segment into Facebook to get a report on their lifestyle, job role and even the pages they follow. You can learn a lot from your competitors. Just like with your marketing campaigns, check out what campaigns did and didn’t work for them. See if you can spot the secret sauce to their success. 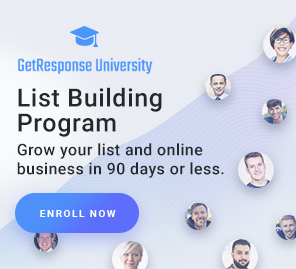 Sign up to their newsletter, browse their site, use tools like SEMrush to see their PPC spend, and use Facebook’s new Info and Ads feature to analyze their aids. You don’t want to copy them. 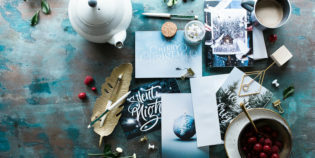 Simply take notes, then use the insights to see what you could do better in your next holiday campaign – focusing on your unique selling point. How do you know if your marketing campaign is a hit? By setting goals to measure it against. Sure, you can easily see sales growth without doing any analysis. But you won’t know what results you could have got. And you probably won’t feel very motivated to improve them. So when planning your next holiday marketing campaign, get clear on what you want to achieve. And set S.M.A.R.T. goals like the ones below – especially if you want to get your team on board. Raise revenue from category X by 30% in December. 10% increase in ecommerce transactions compared to previous campaign. 20% increase in average order value (AOL) of segment Y customers within two months. With such specific goals, you’re ready to make an action plan. Mark key dates for all the tactics you plan to use. You can print out the handy calendar here – then stick it to the wall to keep you on track. For marketers, the holiday season starts with Halloween. Popular with kids and adults, it’s a time for cooking, crafts, dress ups and decorating. In the US and Canada, Halloween kicks off at the start of October. Malls, hotels, restaurants, and coffee chains get into the spirit with themed menus and decor. And little ghouls dress up and collect treats all month long. So if you’re planning a Halloween campaign, be sure to start around the first week of October. 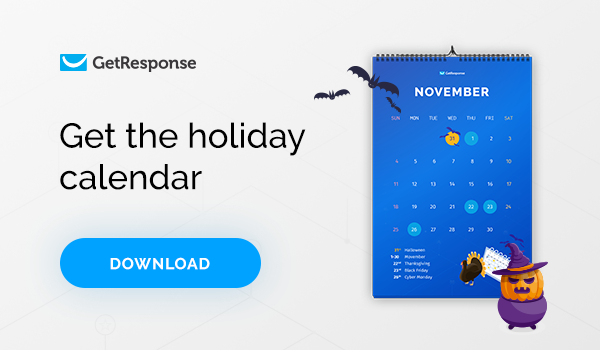 It never hurts to speed up your email list growth – especially for a fun campaign like Halloween. Run a competition for the best Halloween costume, recipe, or DIY decorations. Ask your audience to enter via a landing page or web form and announce the winners on a certain date. It’s win-win: they get a prize, and you get a ton of new leads – plus plenty of user-generated content to use in your future marketing campaigns. Be sure to share it on your site and social channels. The winners will likely want to promote the news to their friends – which means more publicity for a low cost. Organize a raffle and give away a voucher or tickets to a special event. To collect signups, build a landing page with a form, and terms and conditions. Focus on showcasing the value of the raffle, and drive traffic to your page via paid ads or organic posts. 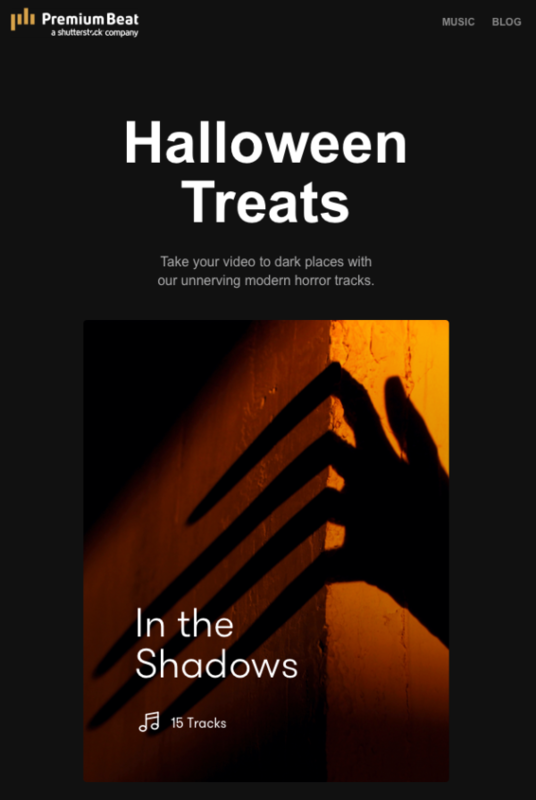 Now you know how to build an email list for Halloween, let’s see how to make scarily good emails your audience will be dying to open. Assuming you already have a memorable ‘from name’ to send your emails, we can move on to the next thing subscribers see: the subject line. You really can’t ignore it. After all, studies show around half of recipients decide whether to open an email based on the subject line alone. What makes an eye-catching email subject? It should be interesting, fun, relevant, and show value. The subject line length, personalization, and use of emojis can also influence its success. Boo! Have we got a spooky deal for you! Ghouls and goblins and deals, oh my! Happy Halloween! We’ve got savings so big it’s scary! Trick or treat? Open up to see what you got! Un-boo-lievable! Take X% off all Halloween! Oh my gourd! Have you seen these prices? SCARY GOOD. Up to X% off the site starts now! Next, let’s look at the first sentence of your email. Even though it’s not as prominent next to your subject line, the preheader can have a big impact on your open rates. Typically, preheaders only have a link to the online version of the message. This is helpful since some providers may automatically block the link. But it’s rare these days. Plus, that small space next to your subject line is valuable real estate. 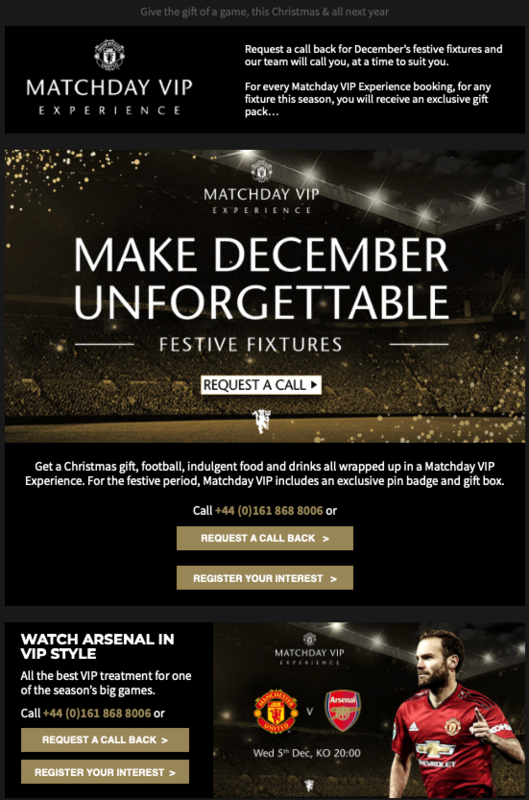 So instead, use the preheader to expand on the subject line – or illustrate a campaign benefit. Email subject line: Don’t miss out on the party! Preheader text: 15% off is ending soon. Don’t miss out on our bestselling styles. Email subject line: Drop Everything. Sitewide Sale. Now. Preheader text: It’s our birthday  Sitewide Sale + Free Shipping & Returns to celebrate! For more inspiration, check out these two examples from Williams Sonoma. Your header should continue the conversation, and follow up on the promise made in the subject line. You only have a few seconds to grab your subscribers, before they click or move on. Add a navigational bar that highlights the email theme: Halloween. Use a big hero image that extends below the fold, so readers are intrigued to scroll down. When designing your header, consider how it fits with the rest of your email content. If it mentions your offer, link it to your landing page with an obvious call to action. If you want recipients to keep scrolling, make sure the copy, images, and call to action button stand out – perhaps with a contrasting background color. Here’s a good example from Mark and Graham. Although the CTA button itself doesn’t stand out, the whole header is clickable and you can straight away tell the theme of this email. Colors catch the eye – so you want to use a color scheme and images that complement the holiday. For Halloween, include orange, black, gray, purple, or red. Just Google ‘Halloween inspired palettes’ for inspiration. Tools like Coolors also make it easy to generate your own palette in a few clicks. Try to also pick images that work well with your email design – and will be easy to create. Will you do a Halloween-themed photoshoot of your products? 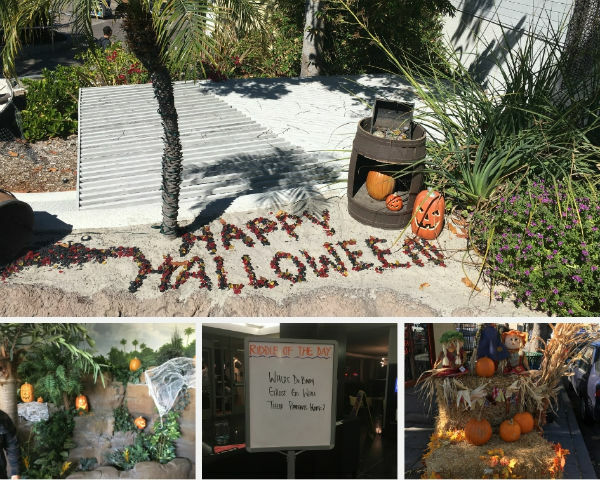 Can you easily and quickly source decorations – and will pumpkins, ghosts, spider webs and zombies enhance your message – or confuse or turn off your audience? If in doubt, test it! Most email campaigns are meant to compel your subscribers to do something – like click through to a landing page, or sign up for a giveaway. That means all your email elements should work together towards that goal. Your email subject line, header, images and copy should all lead to a click. The same is true for your call to action button. Personalize it: use your recipient’s personal or company name in the copy. Use contrasting colors: so the button stands out. Style it right: consider the size and whitespace around your button, so it can be easily clicked – especially on mobile. Use GIFs: animated images tend to get more attention. Use creative copy: skip the standard ‘buy now’ or ‘download’ button and be creative – even if it makes your button a bit bigger. Again, there’s no secret sauce. The same call to action button could generate tons of clicks in one campaign – and barely any in the next. Why? Because all these elements have to unite – and every audience is different. Still stuck? A/B test your button and see what wins. Add it to your email, and enjoy more clicks. Meantime, here’s an email example from Etsy. Pay attention to their CTA as it’s pretty good. The copy’s descriptive and the button itself stands out. Keeping in mind the whole theme of this campaign, it works very well! Movember aims to change the face of men’s health. It takes a fun approach, as men grow moustaches for the month of November – and share selfies to raise awareness and funds for the cause. Plan to get involved? While you should send your announcement email on November 1, you can give your audience an early heads up. You could publish an article or create a dedicated landing page – and use a discreet banner below the fold of your emails to promote it. Even if it’s not the main focus of your October campaigns, it will intrigue your most engaged subscribers – and speed up your campaign launch in early November. There are three ways you can support Movember: grow, give, or move. That’s grow a mo, donate money, or get active every day in November. You can also host an event – a “mo-ment”. It could be a golf tournament, band night, dinner party, or anything that helps raise funds and spread awareness. First, build a campaign landing page that outlines how you’ll help change the lives of many young men. Will you give away 10% of your revenue in November – or the proceeds from Movember-related products? Will you organize some ‘move’ events or ‘mo-ments’ that bring people together? Let subscribers know what’s happening – and ask them to join and share it with others. Run a PPC campaign to drive traffic to your landing page. Add Movember-themed items to customer orders. Update your blog with mo photos and fundraising updates. You could also create content around the cause – like photos, videos, or infographics with tips to grow or groom your mustache. Or send emails featuring famous mos – or fun facts and jokes about ‘staches. Organize a movie night and place a mustache cut-out on your TV. Each time the mustache perfectly fits the person on the screen, someone has to donate to the cause. Just make sure your messages are authentic – and don’t look like your brand is using the campaign for its own gain. How can you design your Movember-themed emails to get the most conversions? Mo Bros and Mo Sistas unite! Are you a true gentleman? No Shave November starts now. See what we’ve planned! Your preheader should support your subject line – and let recipients know what’s inside. Use it to clarify the purpose of your message. And if you want to share your Movember photos, invite others to join the cause, or showcase your products – be direct and brief. Subject line: Get your ‘stache on! Preheader: Could your mustache help men’s health? Movember isn’t about you or your brand. It’s about the cause and how your subscribers can support it. So keep your header short and enticing. For the body copy, you could feature user-generated content or photos of your team in action – with a mustache or two! Remember to add any campaign-specific content to your emails, making the message all about Movember. Other times, you can just add a banner that mentions it, feature a product so others can contribute to the cause, or simply place a mustache beside your logo. Looking for inspiration? Head to your local Movember website and check out the examples below. Make your CTA visible and simple – like ‘grow’, ‘give’ or ‘move’. Again, run some A/B tests to pinpoint the best CTAs. Thanksgiving is the first major holiday of the season, celebrated in Canada, the United States, some Caribbean islands, and Liberia. Traditionally it’s about gratitude, giving thanks, and spending quality time with family and friends. Could these values be the canvas for your campaigns? Time your campaign to start around November 12 – so you have enough time to compel customers to check out your offer. You could start even sooner, if you haven’t run any campaigns for Halloween or Movember. Simply start dropping hints and drive traffic to a campaign-specific landing page or product category. Begin by asking: what is Thanksgiving all about? For many, it’s about spending time and sharing a meal with loved ones. Others see it as a time to give thanks and help others. The first group will probably want traditional food recipes, decoration ideas, and memorable ways to celebrate the day. The second group might prefer tips on how to show their gratitude – or information on how their favorite brands serve others, and value people over profits. Have a think, then turn your ideas into an action plan. You could create a lead magnet to compel prospects to sign up on your landing page – then promote it far and wide. You know the drill: your subject line is like a movie trailer. It has to spark interest so your subscribers want to open your email. Clearly outline the campaign theme (Thanksgiving). Hint at the theme to arouse curiosity. Don’t know which approach is best? Try some A/B testing. Getting ready for Thanksgiving dinner? When you wake up from your food coma: have we got a deal for you! Who’s ready for seconds? The Thanksgiving Sale starts now! Staying in or going out on Thanksgiving? Extra 10% off for early birds only! Let’s celebrate the 旅 day! Thanks to you, we’ve done all this! Gobble gobble! Open up for a feast of savings! Remember, this shouldn’t steal attention from your subject line. Instead, use it to complete it with a subtle mention of your offer. Offering free shipping, 10% off, or another deal? Sneak it into the preheader. Subject line: Who are you thankful for? Subject line: Thanks to you, we’ve done all this! Subject line: What are YOU thankful for? 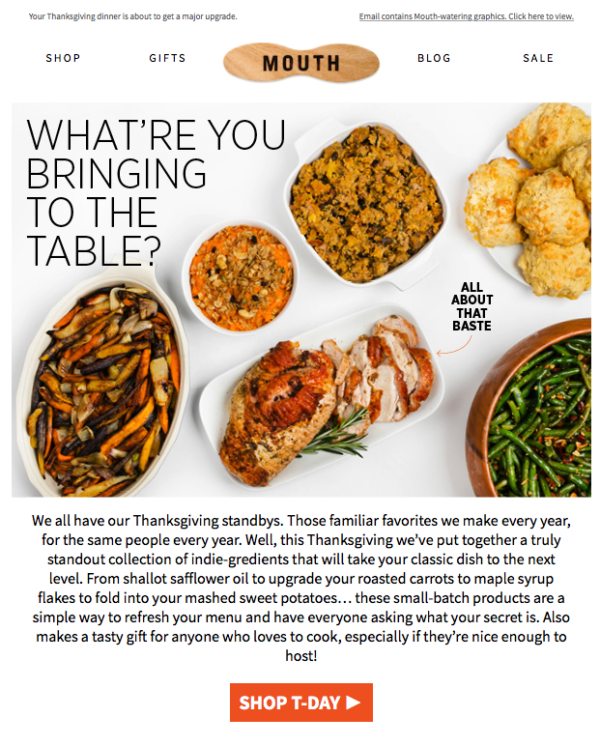 Here’s one interesting preheader text – Your Thanksgiving dinner is about to get a major upgrade, used by Mouth in their Thanksgiving newsletter. Thanksgiving is all about gratitude, generosity, humility and family. So your email should capture those emotions. Choose colors and images that are subtle, not flashy. Use your copy to connect with subscribers and make them feel special. Let them know you need them to bring your plans to life. And be sure to make your offer unique, relevant and helpful. If you’ve already run several holiday marketing campaigns, how can you make this one special? Sometimes it’s not even about making your emails pretty. If your content’s interesting or useful, it’s going to work for your audience. 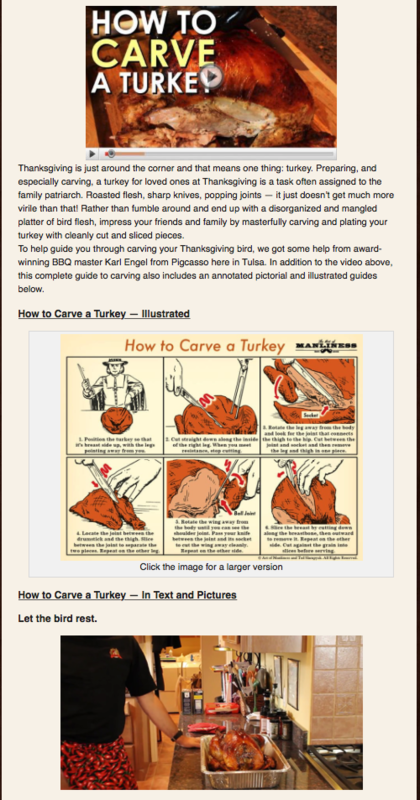 Like in this example from Art of Manliness, where their whole email is about teaching you how to carve a turkey. After reading this content, who wouldn’t want to upgrade and buy a hard copy of their guide? Or you can just try and engage your contacts by inviting them to take part in a deal hunt. 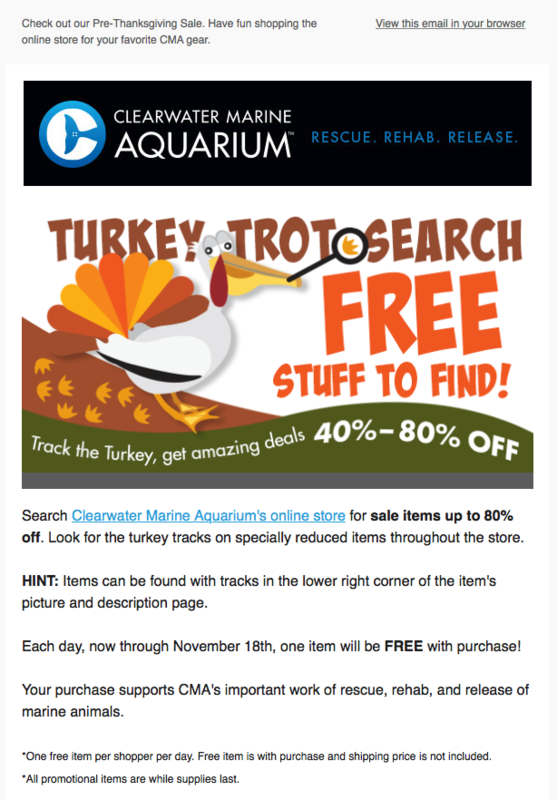 Just like Clearwater Marine Aquarium did in their newsletter below. Alternatively, you can be helpful and offer creative ways to use that leftover ham to cook a delicious meal, like in this example from Show Me The Yummy. 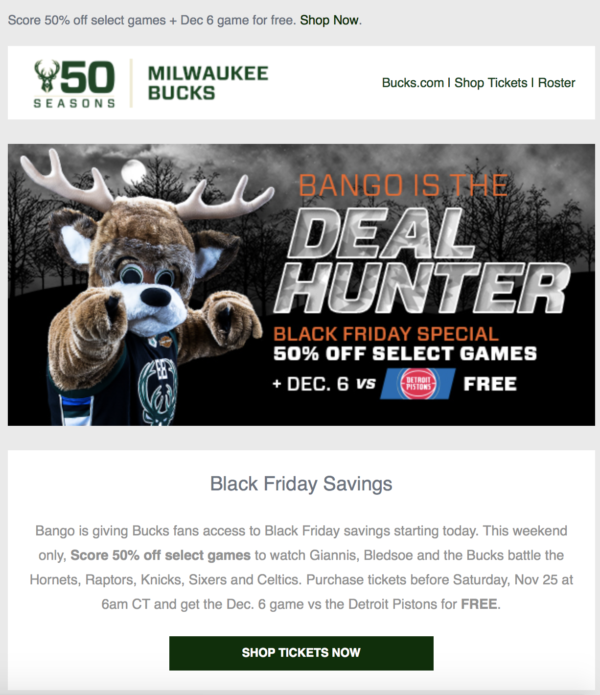 As with other holidays, your main CTA will trigger the sales. Getting attention and igniting curiosity is one thing, but you still need to compel contacts to click – and send them to your landing page or online store. Make it clear what happens when they click. Is it to get more info on an item – or buy? Be creative, but keep it easy to understand. 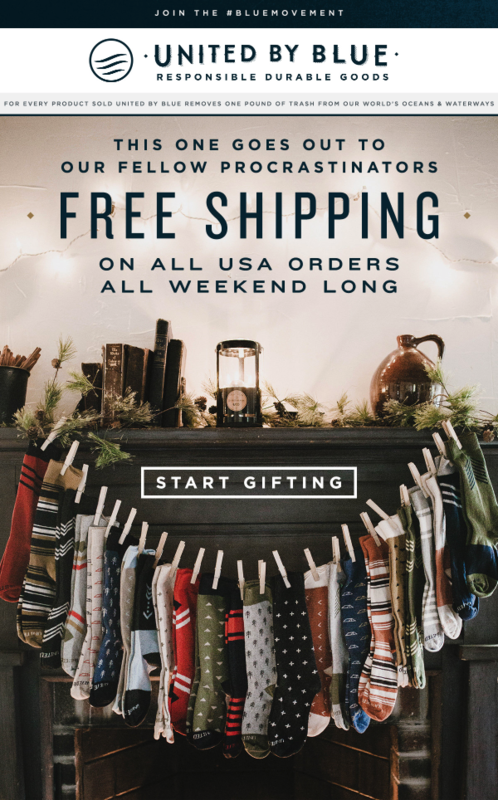 To get you inspired, here’s an interesting example from Sevenly, which focuses on the fact that by buying you can help others. Although this is mainly communicated in their header, their CTAs are also worth looking at: “Claim this offer”, “Buy this hoodie”, “Buy this set”, “Buy this sweatshirt”. Black Friday marks the start of the holiday shopping season. Since it’s all about spending, subscribers are ready for deals. But because it’s the day after Thanksgiving, it can be hard to get noticed. 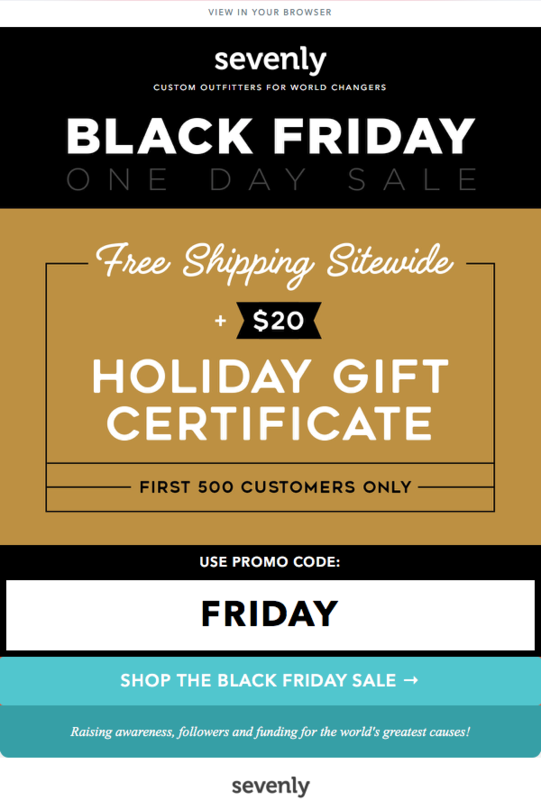 You can still run a successful Black Friday campaign. It’s just best to drop subtle hints in the lead-up, so your customers know to keep an eye out for your offer after Thanksgiving dinner. It’s smart to start one week before Black Friday. In fact, because people are poised to shop, you could even start the night before. Just be aware that if you don’t have a bricks-and-mortar store, you should catch customers before they hit the mall. Some businesses run Black Friday promos over an entire week or weekend. Bear in mind this removes the urgency to buy now, so it might dilute your message and show a less impressive sales spike – although overall revenue will probably make up for it. Black Friday is a fast frenzy. So it’s harder to beef up your email list on the day. Aside from the usual tactics – like offering a discount code or free shipping on first orders – there’s little you can do. What can you do? Make your email list seem like an exclusive club. Use landing pages, pop-up forms, in-store tablets, display banners, and other tools to promote better deals only available to insiders. Plan ahead. Will you offer exclusive content, free giveaways, free shipping and returns, or something else exclusive to subscribers? Anything can happen on Black Friday – and shoppers love the anticipation of unbeatable deals and steals. So use your subject line to build suspense. Below are some other creative examples from one particular brand, MVMT. F%@*! Only a few hours left! Want to convert more contacts to join your newsletter? Use the preheader to give them a nudge. Subject line: It’s finally here! Preheader: Prepare to be shocked! On Black Friday, things move fast. Very fast. So your customers want to quickly see if your deal really is the best – or if they should shop elsewhere. That’s why your header and content should be all about your products. No articles, no funny videos, just offers. So keep your header clear and concise. It should only take a second or two to make sense of your offer. Add a navigational bar, high-quality images, and short copy. Your goal: get people to your landing page ASAP. The color palette should contrast black with your brand colors. Here’s how Sevenly designed their email campaign to get their email subscribers to the landing quickly. Notice how they’ve created an additional sense of urgency by offering their deal only to the first 500 customers who redeem the code. This email from Huckberry’s also uses the idea of matching the template’s color to the holiday. Want to try something else? Don’t forget about GIFs. They may not be as popular these days, but every now and then they can be useful if you want to catch your email subscribers’ attention. Here’s some more inspiration, this time from Casper. This email’s less about the design, but more about the idea – sharing the revenue with a charity organization. Not that unusual, but still special and valuable. Your CTA should be descriptive, convincing, and fun. Place it in a very visible spot and convince contacts they need to buy now – or miss out! A winning CTA depends on your audience. 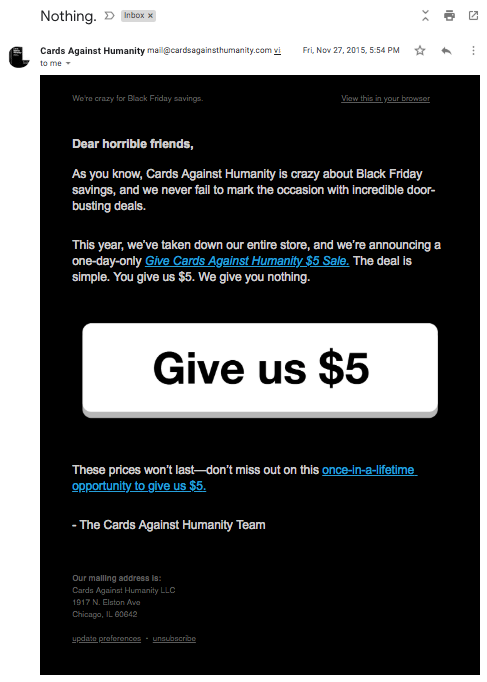 This example from Cards Against Humanity was hugely successful – even though it went against best practice. Notice also their short but very intriguing subject line. Cyber Monday is considered the biggest online shopping day of the year, on the Monday after Thanksgiving. 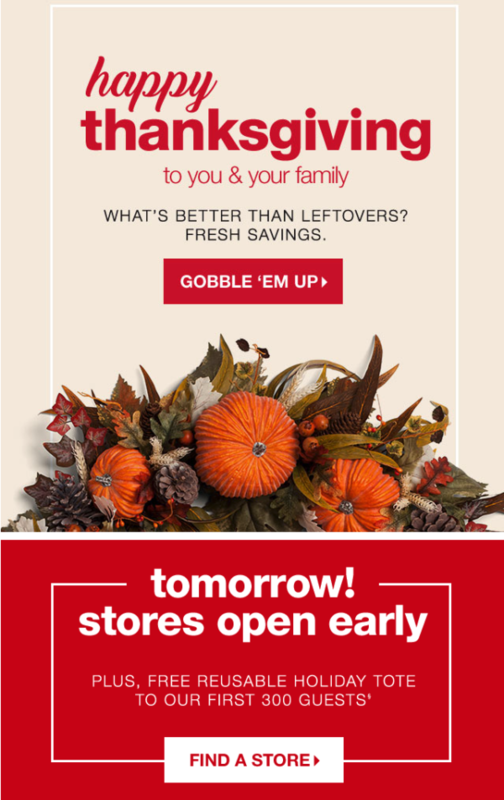 If you’ve run Thanksgiving and Black Friday campaigns, it’s wise to give your audience a break before marketing at them again. The day is all about online shopping – so you need to focus on driving traffic to your site. But because competition is fierce, you need to get creative and offer something unique. What makes Cyber Monday unique? Shoppers from all over the world wait ‘til the day to bag a bargain – the savings are that good. Do you offer international shipping – and is it fast enough? Are your offer terms (like free refunds) clear – and available to international customers? Is your site localized? Do prices and tax automatically convert to the customer’s currency? Is it easy to place an order with an international address – such as different zip code formats? Even if you don’t sell overseas, it’s worth keeping international buyers in mind if your analytics show they visit your site. On top of the tips we covered for other holidays, you might like to consider wishlists to grow your Cyber Monday list. Wishlists reduce the risk of customers going elsewhere for a product they’ve been waiting for. They simply sign up and get a notification when the product is back in stock or has dropped in price. And that means wishlists could be your secret tactic for getting many more conversions. It’s also an essential tool for ecommerce businesses that sell premium products or have limited stock. Like Xmas but better. 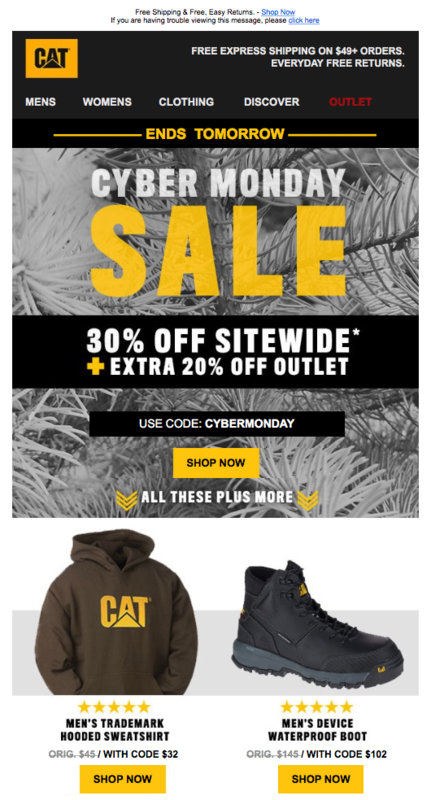 Cyber Monday is here! Say hello to amazing savings! Oops, we’ve gone a bit overboard! Hello? Is it savings you’re looking for? Cyber Monday 24-hour sale starts now! As always, the preheader should complement and complete the subject line story. Subject line: It’s now or never! Preheader: Who are we to judge? Subject line: Hello? Is it savings you’re looking for? Preheader: This joke is awful, but our offers are awesome! Preheader: There’s still time (but not much)! Get an extra 20@ on already marked-down boots, shoes, and more! You have to pull out all your top tactics to outperform your Cyber Monday competitors. Amazing offers: will free shipping be enough to win over your contacts? Dig into your CRM and pinpoint product categories customers bought from before. Then use dynamic content to personalize your emails with offers on the top category. You can also highlight best-selling or premium products from a complementary category. Do the same on your site, showcasing suggested items beside the customer’s shopping cart – with a special deal or free shipping when added to their order. Remember, each extra item added to the cart covers the costs of finding new customers. And once your customer checks out, they’ll be more willing to buy from you next time. Whatever you do, bear in mind Cyber Monday moves fast. So make sure to A/B test the most critical campaign elements. Craft your calls to action carefully. Be creative and skip the standard “buy now” copy – while sticking to your unique brand voice. 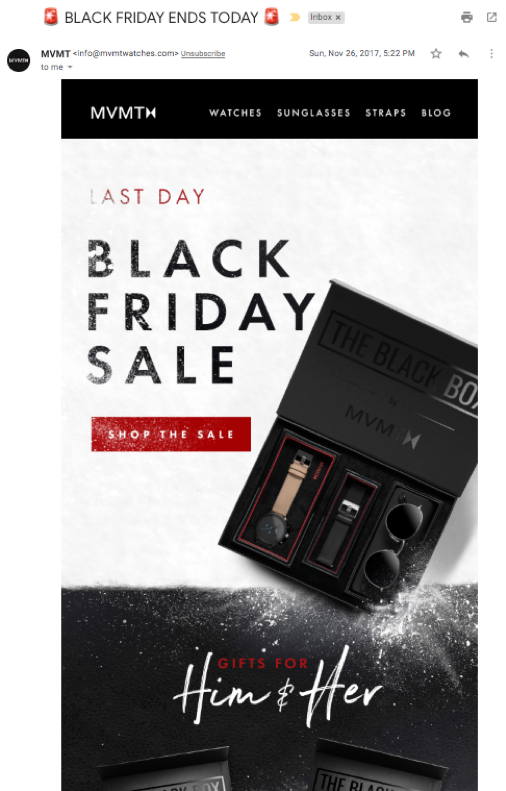 Here’s an example of a slightly unoriginal but very clear call to action button from Cyber Monday newsletter sent by GQ. Shopping season is coming to an end. But first, there’s Christmas. A time to switch off, spend time with loved ones and exchange gifts. And because people tend to put a lot of time and thought into finding the perfect gift (perhaps like the one below? ), you have all December to promote your products. Some retailers start as early as November – and there are even Christmas shops that run all year long! Between Cyber Monday and Christmas, there are only a few smaller events like Super Saturday and Free Shipping Day. So most brands just focus on Christmas marketing. Since your Christmas campaign can run for a while, there’s a good chance you’ll build a strong list. Run a ‘12 Days of Christmas’ campaign. Send daily offers or gift inspirations to those who signed up via an exclusive landing page.Of course, you’ll need to promote the page across your social media channels, in your newsletter, or with paid ads. But your list will grow with a group of people interested in hearing from you. Create an advent calendar campaign. Follow the same steps as above, with 25 days to convince your customers to buy their gifts from you. Create a Christmas guide to decorations, interiors inspiration, or recipes. Then use it as a lead magnet on your landing pages and in pop up forms, to build an email list of people looking for something special. Build your campaign around a cause. Donate a portion of your revenue to a chosen charity (like you did for Movember) and promote it so customers can feel good – and do good – buying from you. 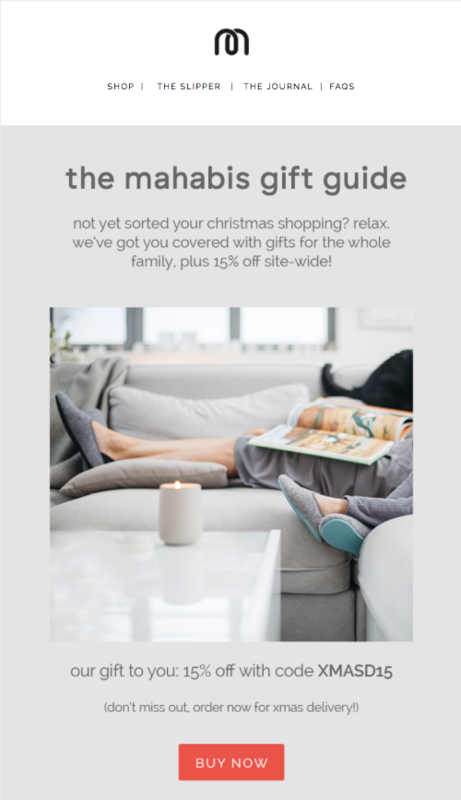 Speaking of guides, here’s an email promoting a gift guide created by Mahabis. There’s something magical about Christmas. Carol singing, Wham’s Last Christmas rocking the radio, decorations, mulled wine, Starbuck’s Christmas blend, and quality time with family and friends. What’s not to love? But as a marketer, you’ll probably focus on one thing in your campaign: gifts. Of course, if you find yourself all Christmased out, why not do something different? Mix up your messages, say something less festive, or try out a new A/B test variant to see what works. Ho ho ho! 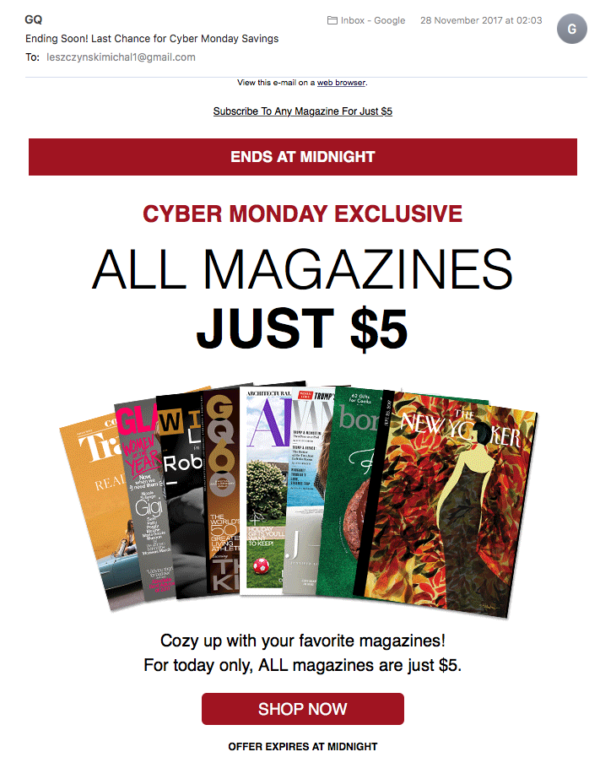 Holiday savings inside! Deals as red-hot as Rudolph’s nose! Michael Bublé or Mariah Carey? Looking for Christmas gift inspirations? Don’t risk it. Buy your own perfect gift! Out of ideas? Get a gift card! 5 Christmas dinner conversation starters. You’ll thanks us later! The preheader can either continue the story from your subject line, or add a sweetener like free giftwrap. Subject line: Out of ideas? Get a gift card! Subject line: Don’t risk it. Buy your own perfect gift! Your emails should evoke that Christmas magic: sitting by the fire, unwrapping gifts, or being with the ones you love. Stick to a familiar color scheme: gold, red, yellow, and green. Use Coolors or search Christmas-themed color palettes in Google to get inspired. Your product shots should also look festive. You could even stage a themed shoot to get customers in the holiday spirit. And once again, consider using animated GIFs. Like in this example from MVMT, which helps you feel like you’re already unwrapping the gift yourself. Or be even more creative, like in this example from Free People. Word of warning though, animated videos (this one even included music!) that are particular heavy can trigger ISPs’ spam filters! And if you don’t necessarily want to talk about Christmas again, consider whatever comes next, like New Year’s Eve and New Year’s resolutions. Should your CTA be short and sweet, or descriptive? There’s only one way to find out: test it. Claim your Christmas coupon now! Alternatively, you could just invite your subscribers to “start gifting”, like United By Blue does in their email below. What’s your holiday marketing campaign plan? Now that you have all our holiday marketing campaign secrets, what will you do? Let us know what holidays you’re targeting – and the tactics you plan to use. 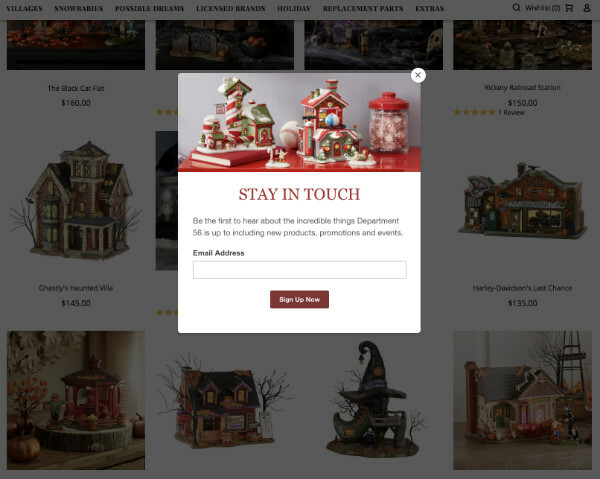 Are you planning to run your marketing campaigns around key holidays like Halloween, Black Friday, or Christmas? Download this guide and get more sales with automated email campaigns. 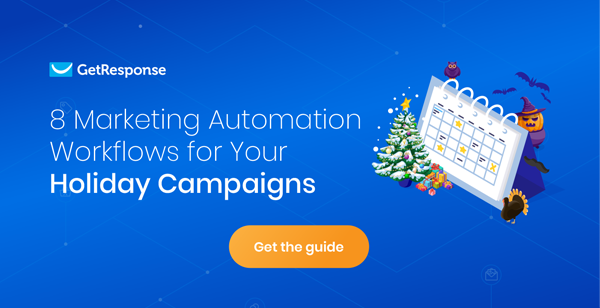 These eight marketing automation workflows will save you time and increase your conversions in the hottest sales season of the year.